The third tonsil can be a problem for children. It is situated behind the nasal cavity's opening. It has an important role in protecting the system from infection. However, it can increase to such a level that it results in heavy breathing of the child through the nose, in snoring, or problems sleeping and frequently awaking. Since the air isn’t passing through the nose, it is therefore not being purified, and the child is then more prone to infections of the nose, sinuses, ear and lungs. All of the above can slow down a child’s growth. The child is pale, breathes through the open mouth (because of the nasal secretion) and looks sleepy. Pressure applied to the Eustachian tube (a small tube regulating pressure in the middle ear) can cause bacterial inflammations of the middle ear so the child also experiences certain hearing problems. It is very important to consult an otorhinolaryngologist who will use the anamnesis, clinical manifestations and the child’s age to assess whether surgery is needed. As the only product with the “3-in-1 concept”, the Meralys nasal spray represents a new form of rhinologic therapy and an absolute novelty on the market. It is intended for children from 2 to 12 years of age. The product is preservative free for an increased safety of use. 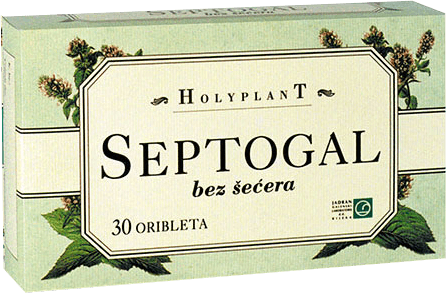 Holyplant Septogal pastilles are recommended in cases of mild inflammation of the mouth and throat, and for the common cold. Positive effect on hoarseness. Used as a mouth refresher for bad breath and to maintain the normal state of the mouth and throat mucosa.